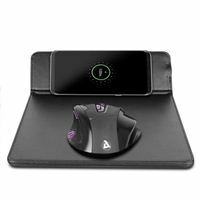 Qi Wireless 10W Charging Mouse Pad combines the functions of a sleek mouse pad and a mobile phone stand and wireless charger. Up your multi-tasking skills by charging any Qi-enabled device while using your computer. You no longer have to worry about leaving your desk with a dead device. Simply place your Qi-enabled device on the Qi charge icon and the Qi charger begins charging your mobile phone instantly. The functional built-in stand allows for comfortable viewing, so you don't have to worry about missing important calls or texts while waiting for your device to charge. The large surface area, smooth tracking surface and stitched edges makes the wireless charging mouse pad a durable surface for gamers. Never again will your game be interrupted by a text or phone call, your charging device is within your fingertips for easy access.